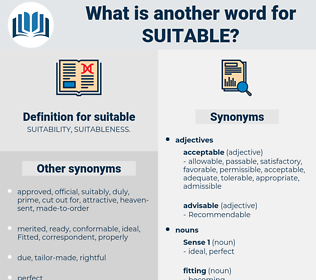 What is another word for suitable? sufficient, timely, best, better, reliable, accurate, permissible, Indicated, beneficial, helpful, successful, practicable, efficient, enough, possible, equitable, optimum, admissible, required, likely. Catered, adopted, matched, upgraded, adjusted, required. suits, corresponds, Addresses, works, meets. 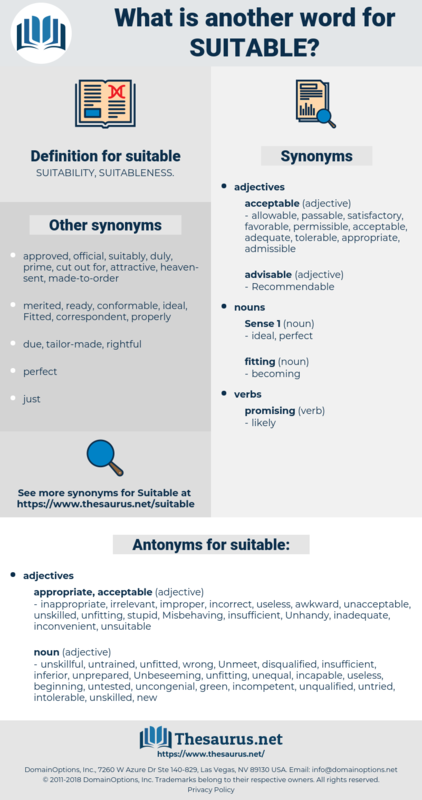 unsuitable, desirable, acceptable, reasonable, favourable, advisable, well-suited, usable, inappropriate, feasible, fitting, expedient, satisfactory, tailored, decent, sustainable, viable, propitious, useful, qualified, useable, compatible, pertinent, amenable, favorable, able, adaptable, sensible, opportune, adapted, susceptible, inadequate, responsive, valid, apt, well-qualified, serviceable, tailor-made, supportive, accessible, adjusted, corresponding, recognizable, proper, respectable, agreeable, meaningful, hospitable, available, workable, consistent, customized, worthwhile, requisite, skilled, comfortable, recognisable, congenial, optimal, eligible, identifiable, apposite, advantageous, effective, attuned, preferable, worthy, attractive, palatable, meritorious, fertile, valuable, ready, unfit, befitting, distinguishable, undesirable, respective, affordable, enabling, tolerable. inappropriate, irrelevant, improper, incorrect, useless, awkward, unacceptable, unskilled, unfitting, stupid, Misbehaving, insufficient, Unhandy, inadequate, inconvenient, unsuitable. new, uncongenial, green, incompetent, inexpert, unprepared, untried, unqualified, inferior, Unmeet, unskillful, disqualified, untested, Unbeseeming, beginning, unschooled, Misbecoming, incapable, intolerable, inexperienced, wrong, unequal, worthless, unfitted, untrained, raw, unseasoned. Quite an elegant remark; suitable to Jake, hardly to be expected from you.
" Nothing could be more suitable than -" " I don't intend to marry anybody until I'm thirty at least, so that ends it, daddy, - I mean, your poor old highness."